Hello ... Hello ... my old friends ... It's great to see you once again! I've heard it said sometimes that this band or that singer are "criminally underrated". I've also seen lists of the excluded rather than an appreciation of what has been included when it comes to the the release of compilations covering the careers of certain groups or artistes. But if ever there were a band who deserved attention and recognition it is those genial "Irish Alt-Pop Favourites" who are Pugwash. And there will never be a more worthy summary released of a band under the proverbial radar as the long awaited overview of their career to date entitled "A Rose In A Garden Of Weeds: A Preamble Through The History Of Pugwash" [Omnivore Recordings #OVCD-100]. Listening to this seventeen opus of the musical outpourings of Thomas Walsh [and friends] is much akin to approaching musical, harmonic and lyrical ecstasy as you drink in this carefully selected menu of tracks from the five Pugwash studio albums to date: "Almond Tea" ; "Almanac" ; "Jollity" ; "Eleven Modern Antiquities"  and "The Olympus Sound" . What is served up here by the Dublin based quartet is both the perfect introduction to new fans [including those lucky souls who will see the band play their first dates in the US in October] and the greatest of tributes for their growing army of admirers. With the influences of Thomas' beloved ELO & Jeff Lynne as well as The Idle Race, Roy Wood, The Beach Boys, The Beatles, XTC [and not a few others], this record is a real delight to the ears. Every track is a gem yet I still keep hitting the repeat button for "Take Me Away", "Heal Me", Finer Things In Life", "It's Nice To Be Nice", "Fall Down", "Here" and "Apples". Find out more about Pugwash via their Official Facebook page. 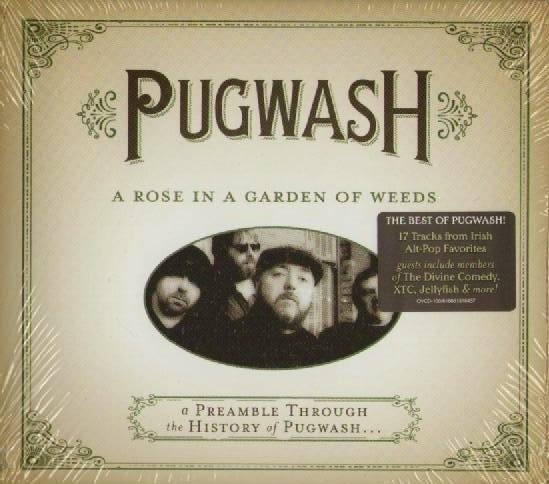 "A Rose In A Garden Of Weeds: A Preamble Through The History Of Pugwash" is available in CD or MP3 format from Omnivore Recordings, amazon.co.uk, amazon.com and all reputable vendors. All very fine tracks and could have just as easily been a totally different 17 tracks, which would be equally good. Pugwash don't do filler tracks on their albums.